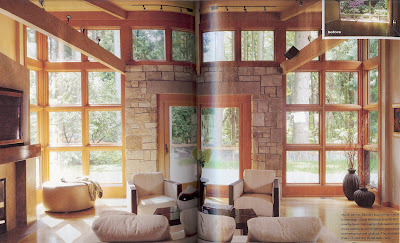 Lots of windows and lots of light are a must. Interesting windows are even better. My initial instinct would have been to just have solid glass to have as much view as possible, but the simple complexity (?) of this wall is just so visually appealing. scanned via Spring Renovation Style? OK after closer inspection I just realized it's doors, not a fireplace (which is off to the left). Will be calling the old folks' home immediately. Reserve a room for me too!